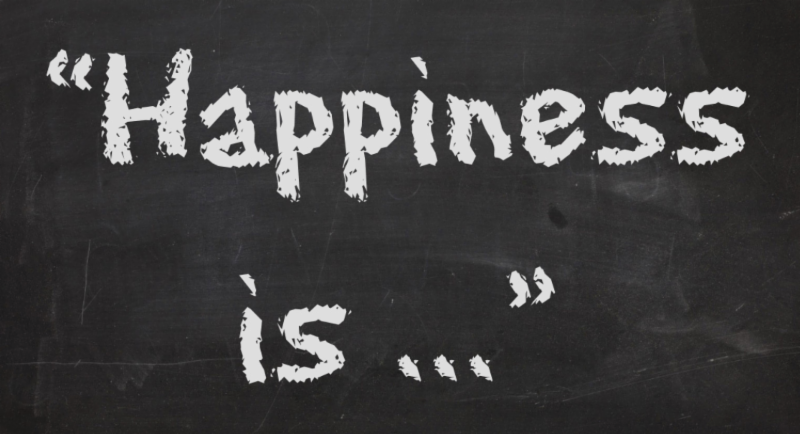 Everywhere we look, there’s somebody touting a way to get happy. Buy stuff. Get rid of stuff. Pursue a relationship. Flee a relationship. Eat chocolate. Read a blog. Write a journal, sniff an aroma, keep houseplants. Here's an idea that delivers every time: PLAY. We're not talking about zoning out in front of the TV. No. We're talking about giving yourself over to pure fun, the rejuvenating kind. When we anticipate it, when we share it, and when we reflect back on our time spent goofing off, it juices up our brains and our bodies in extremely healthful ways. And yet, fact is, adults tend to dismiss play as unproductive or irresponsible. For us at PBV, play is no trivial thing, and every July, we offer Play Practice for those who need it. Be warned--if you join us, you will be required to play every single day, until you begin to fully experience the benefits. ...Jumping into a rolling festival. ...Swinging a leg over that bike, and letting Iowa blow your hair back. ...Hanging out with farm animals, mannequins, and Midwesterners in costume. ABOVE and RIGHT: Our friend, Ed, who has a black-belt in Play. ...Grinding away on Iowa chops and sweet corn. ...Slipping out of your sandals and dancing in the grass. ...Watching fireflies twinkle when the sun goes down. ...Lying back in your tent and reflecting on your day's Play Practice. adopt this regimen for seven full days. To the newcomers reading this letter for the first time, we know you're thinking about logistics and details. Don't worry. We're about to explain how you can focus on pedaling your Iowa miles while PBV does the rest. 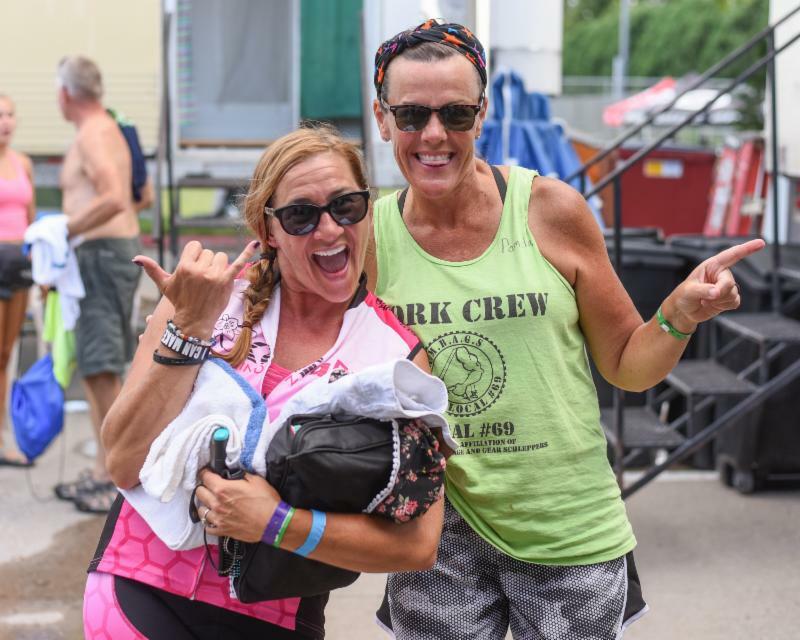 When you sign up our Weeklong Support, you avail yourself of our strong and friendly crew, our custom-built equipment, and our longtime RAGBRAI experience. To the veterans who have joined us in the past, we're always trying to serve you better, and this year, we are setting more goals for improvement than ever before. We'll tell you part of the story in this letter, and we'll save a few surprises for later, too. And so, on this day, January 26th, in the Year of the Pig, 2019, we do cordially invite you to pedal from West to East, from the Muddy Missouri River to the wide Mississippi, with Pork Belly Ventures as your happy home base. Won’t you join us? Feel free to share this letter. Hang onto it so you can find the details when you need them. There is a lot of information for those who want to keep reading. If you've already asked your questions and know your plans, feel free to sign up for our services today. You'll find our online application at www.pkbelly.com. Stay tuned for Update #1 with all shuttle details and departure times. Don't make airline reservations, please, till you know when your shuttle departs! What are the ride dates? The ride begins before dawn on Sunday, July 21st, and ends on Saturday, July 27th. 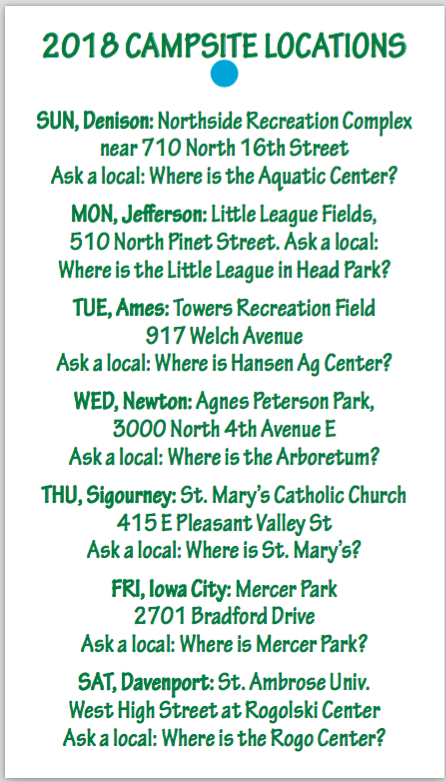 That means that we'll meet up with most of you on Saturday, the 20th, either at the Omaha or Des Moines airport, the end-town long-term parking area, or at the PBV campground in the start town. A considerable number of you will fly or drive into Omaha on Friday, July 19th, and stay in one of our designated airport hotels. Most of those using our East/West Shuttle will drive to the end town on Friday, the 19th. We have included details on these options in the FAQs below. What's this year's route? We’ve been south, then north, then middling in the past three years, so it was anybody’s guess where this year’s route might go. Well, now we know that it's an unusual route with two towns on the Mississippi River. Here are the overnight towns and the daily mileage: Council Bluffs to Atlantic (58 miles on Sunday), to Winterset (68 miles on Monday), to Indianola (39 miles on Tuesday), to Centerville (78 miles on Wednesday), to Fairfield (65 miles on Thursday), to Burlington (57 miles on Friday). The ride ends in Keokuk, the southernmost town of Iowa, with 62 miles to ride on the final Saturday. Total mileage is 427, and it's the 8th flattest, 6th shortest, and the 8th easiest in RAGBRAI history. 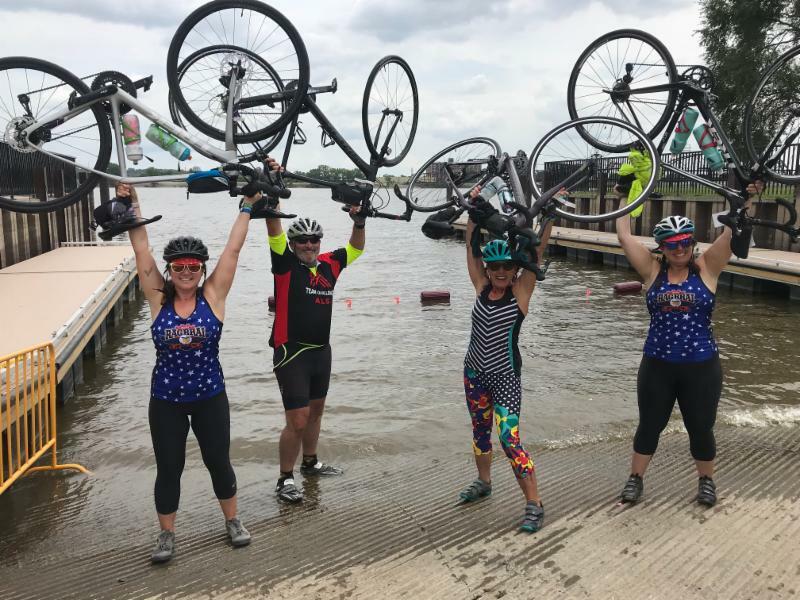 You can find out more about the route here: 2019 RAGBRAI Route, Something Different! We'll publish more about our overnight host towns in future updates. We sure are thrilled to know where we're going. What recent improvements has PBV made? NEW Our NEW Coffee Trailer The guys have been building again, and our new coffee trailer will bring the coffee spigots down to countertop level for our caffeine-cravers in the morning. One awning swings open for coffee service, and another swings open for the cream and sugar area. 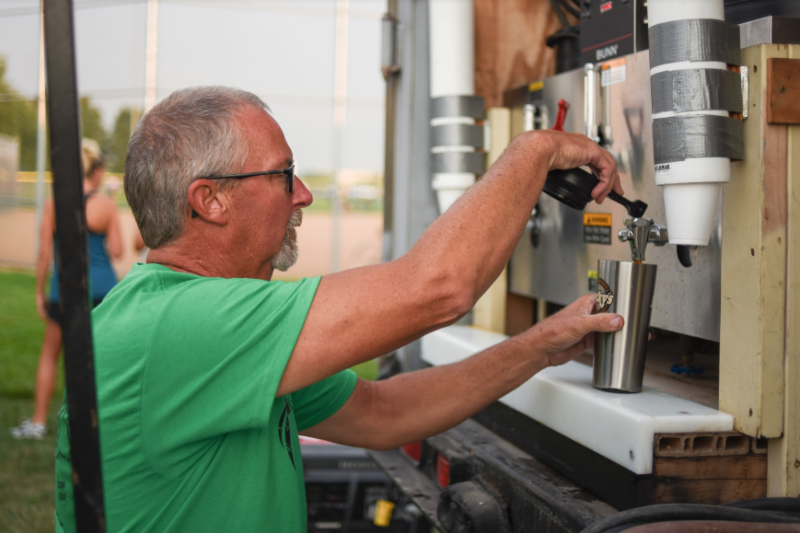 We brew six gallons every eight minutes, and this new trailer should help us serve it faster! We’ll still have hot water and tea bags too! NEW Campground Orientation Board Several of us are teaming up to develop a big board to display printed GoogleMaps of each day’s campsite. Moveable magnetic pieces will show “You Are Here” and the locations of all parts of the Pork Infrastructure. NEW Bike Shipping Partnership For the first time, SendMyBike.com will partner with Bike Flights to improve both our price and our service. Bike Flights will provide all shipping labels, while SendMyBike.com and PBV provide the ground game. It's the best of both worlds. We'll continue to offer the popular option of having your shipped bike pre-assembled before you arrive in Iowa. Give us a little time to work out the details, and expect more on bike shipping next month! NEW Daily GPX Files PBV already provides three ways to find our campsites each day: Our locations card, our host-town maps, and our signage from the route to camp. This year we’re adding GPX files for navigation to our campsites. We have a few other ideas too, which we’ll save for later. Talent on Stage According to our survey and our testimonials, our riders absolutely loved last year's entertainment, seven bands in seven days. We’re already booking entertainment for July, including some of your favorites and some surprises, too. About 6:00 each evening, you’ll sit down with your dinner plate and enjoy the show. Kybos in Camp We will increase the number of kybos in Pork Camp this year. 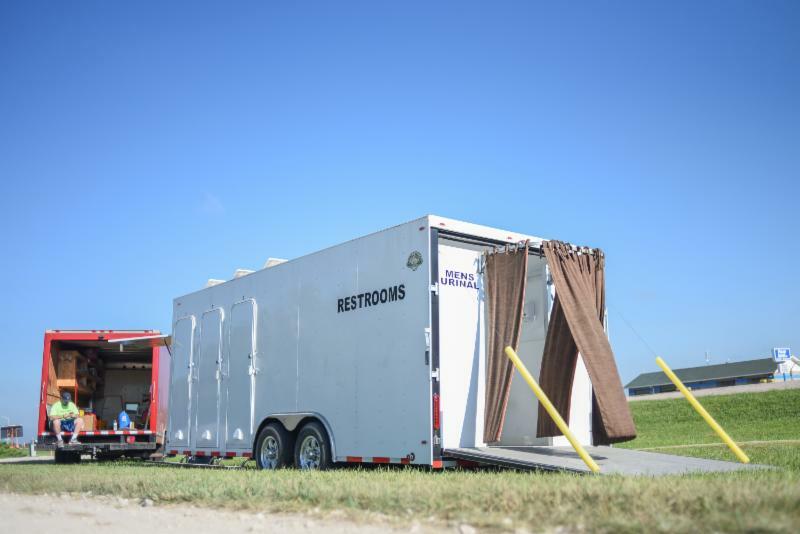 Although the toilet standard on RAGBRAI has been about 1:100, PBV goes well beyond by contracting for porta-toilets in our campsites each day and providing our custom-built restroom trailer with twelve flushing porcelain fixtures, lighting, ventilation, and sinks. E-Bike Charging We just got an invitation to a conference about ebikes. If you have suffered an injury, if you're new to distance cycling, or if you find you need intermittent e-assistance nowadays—then you might be one of the millions of pedalers opting for an ebike. For those on our Weeklong Support, PBV can provide charging for e-bikes, but we need to know if you’re bringing one to Iowa. Write to us, please. If you’re not on our list, we can’t promise to help you charge up. "Half Hog" Options, or Partial-Week Support on RAGBRAI You can ride any number of consecutive days of RAGBRAI with PBV. If you want to ride the first half or last half, we prorate our weeklong support, and most importantly, we offer convenient shuttles on Tuesday afternoon. 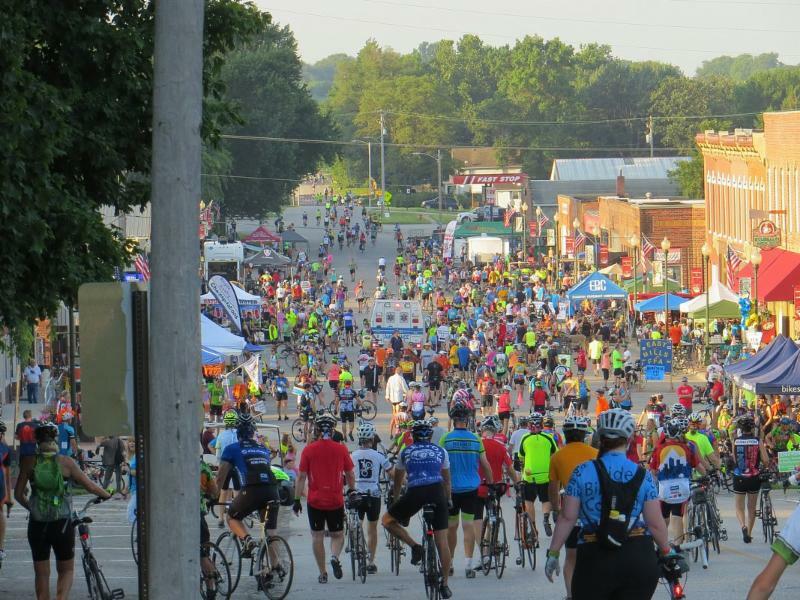 You can exit after riding the first half of the week or enter RAGBRAI midweek and ride the last four days. The Tuesday exit/enter point works well for both folks who drive and those who fly. Once the route has been out for a week or ten days, we'll offer a fuller explanation of all shuttles, including our Half Hog options. Also see our list of services and prices below. The Pork Infrastructure We keep building, fixing, painting, purchasing, staffing, and improving our infrastructure, with 14 semi-trailers and a growing variety of smaller special-purpose trailers custom-built to serve you. New shade canopies this year will add to the social zones in camp. The Misting Trailer houses misting fans to keep you chill. The Massage Recovery Tent shelters ten therapists and an appointment desk. 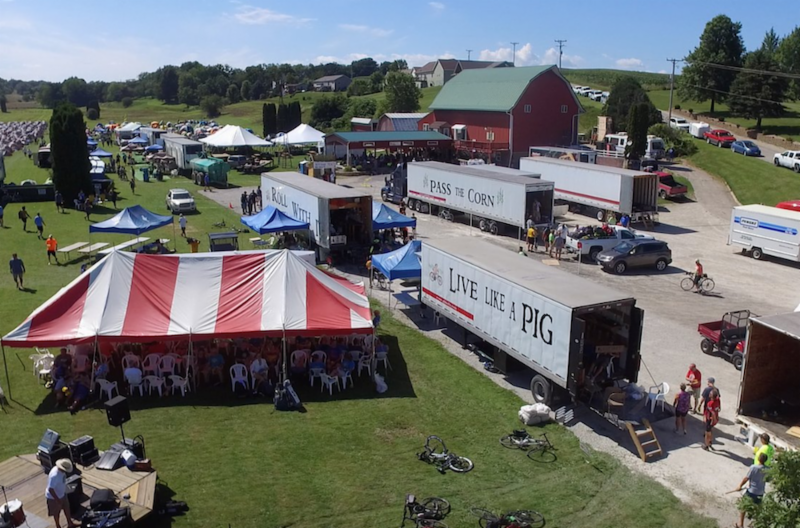 The Pork Infrastructure also includes Banks of Kybos and our Restroom Trailer, several Hand-Sanitizing Stations, our two Phone-Charging Trailers, the new Coffee Trailer, our Front Desk Trailer, and more. 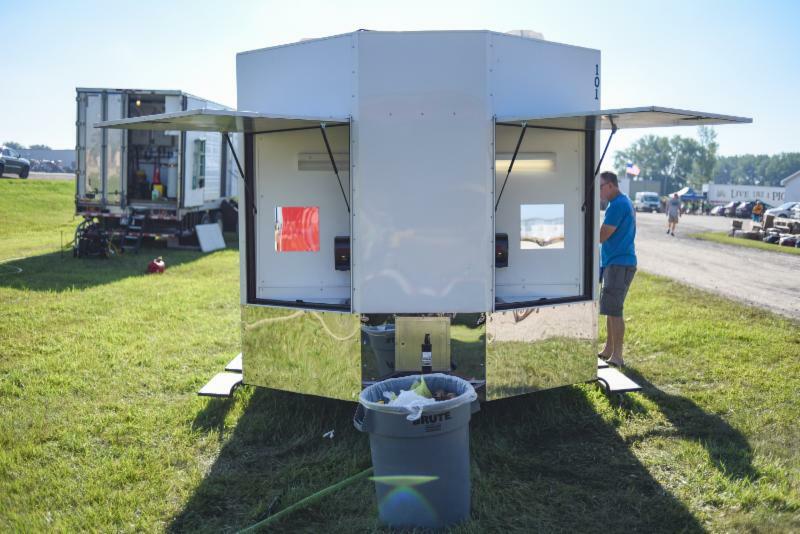 On the three PBV Shower Trailers, we offer 56 private dressing rooms, 56 shower stalls, endless hot water, a clean towel, liquid soap dispensers, more than one shower per day if you want it. 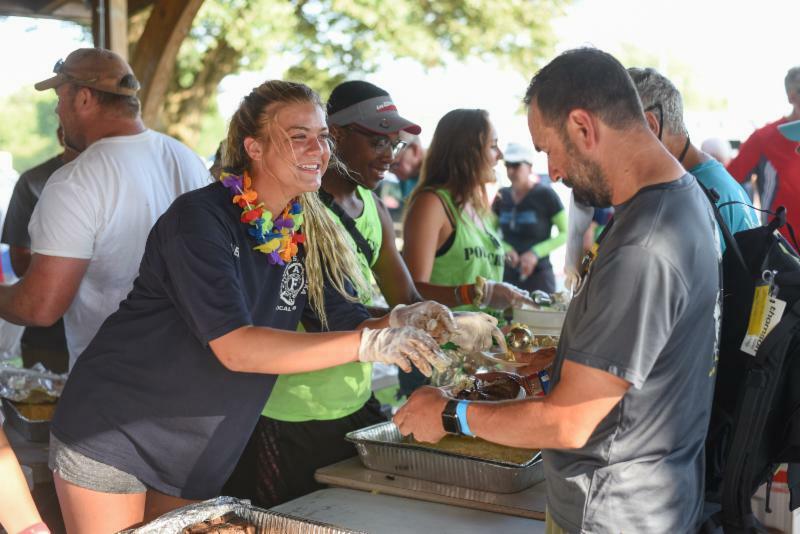 On RAGBRAI, Porkers, it just doesn't get any better than that. Pork Extras As usual, PBV will offer Hotel Stays later in the season. Once the route is announced, there's a race for hotel rooms—and we are in it to win. Usually we can secure large blocks of hotel rooms on a few nights and small blocks of rooms on the others. Our motorcoach will transfer Porkers to/from camp. Once we meet our hosts, we'll try to arrange Indoor Camping on as many nights as possible. Last year, we arranged indoor camping on a record five nights. For a small donation to our hosts, Porkers were invited to reserve air-conditioned sleeping space ahead of time. Every year, it's a new ballgame, but we'll try our best for a roof over your heads on two or more nights. These options will be published to all Porkers in June. And watch for more info on our other extras like Midweek Laundry Service and Optional Dinners in Camp. We're always thinking about Pork Perks and Pork Pleasures to offer you, so watch our updates. Please scroll for the full description of our 2019 support. What are Pork Belly's SERVICES AND PRICES? Here is our menu of services, mainly in chronological order. Scroll for our round-trip Des Moines Shuttle at the end, and keep scrolling for the full description of what is included in our support. If you want to park your car in the end town before the ride, we'll meet you there either on Friday afternoon (the 19th) or early on Saturday (the 20th) and transport you, your baggage, and your bike to the start town. 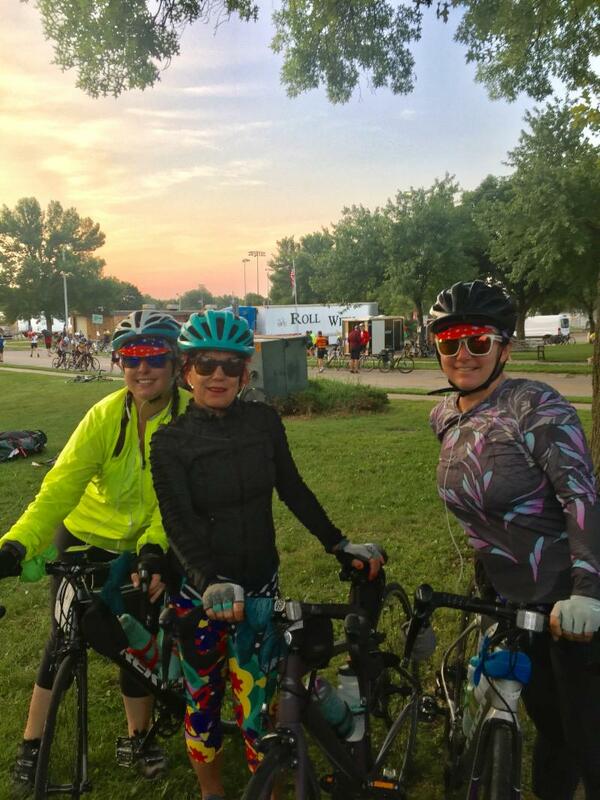 While you bicycle each day, we will transport your baggage across Iowa for the week, from west to east, providing great campsites, meals, entertainment, your daily shower and towel fee, and many amenities and support services, described more fully below. $425 per person for the full week. We can prorate this price for partial-week clients at $65 per person per day. Weeklong Support for Non-Riders is available for $560 per person, and please contact us for a visit about your week. Partial Week with Pork Belly Ventures is $65 per person per day. Consecutive days only. Child Price for Weeklong Support is $200 for kids under 13 years of age, and they must be accompanied by an adult, of course. Return Bus to Omaha On Saturday, the 27th, we'll transport you, your baggage, and your bike from the end town to an Omaha Airport hotel (see Hotel section below), so you can fly or drive home on Sunday. Shuttle to Airport Near End-Town On Saturday, the 27th, we'll transport you and your baggage (let us know if you'll have a bike) from the end town to the largest Iowa airport in the east, the Quad Cities International Airport (MLI). We will soon publish two afternoon departure times. Please stand by as we complete our planning, and watch for our next update on shuttle details and departure times. Optional Tent Rental and Daily Set-up See fuller description and details below. Available only to those on our Weeklong Support. We do not prorate this service for a partial week. $495 per tent - price is the same for one or two tent occupants. Shuttle service from Des Moines to the start town is $115 per person. The return from the end town to Des Moines is $140 per person. The round trip Des Moines bus service is $255. We'll depart from and return to the AmericInn Airport Hotel at the Des Moines airport. Half-Hog Shuttle exit on Tuesday afternoon, from our campsite in Indianola to a Des Moines airport hotel. This is for those who ride the first three days, Sunday, Monday, and Tuesday. We'll publish complete details in our next update. Half-Hog Shuttle enter on Tuesday afternoon, from a Des Moines airport hotel to our campsite in Indianola. This shuttle is for those who enter the ride late and cycle Wednesday through Saturday. We'll publish complete details in our next update. WITHIN A WEEK, WE WILL PUBLISH A NEW UPDATE WITH FURTHER DETAIL AND PROJECTED DEPARTURE TIMES FOR ALL SHUTTLES. Our services are available on an ala carte basis. You may use any combination of these services (except that the optional Tent Rental and Daily Set-up is available only to those on our Weeklong Support). For all shuttles, we use comfortable, quality motor coaches, restroom-equipped and air-conditioned. What all is included in PBV's Weeklong Support in 2019? 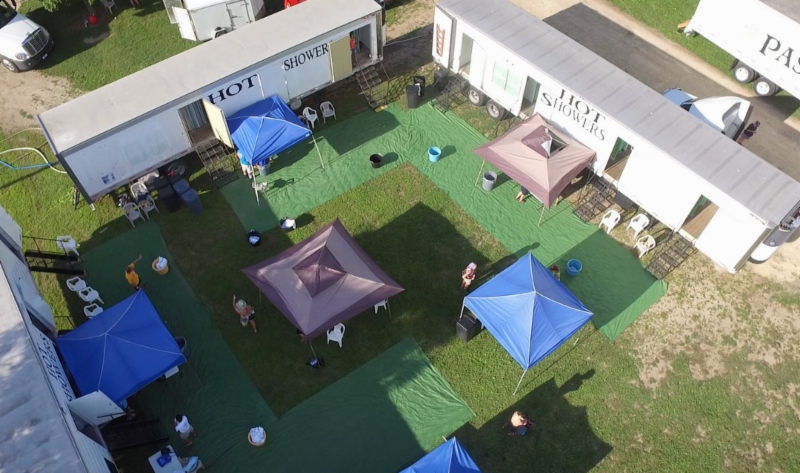 Your Daily Shower and Towel You'll find endless hot water, liquid soap dispensers, and fresh towels in our three air-conditioned shower trailers right in camp. Pork Belly Ventures offers a total of 56 stalls, with a private dressing area for every stall. You can take more than one shower a day if you like. Your PBV wristband admits you to the shower. Two Dozen or More Kybos (porta-toilets) contracted by PBV, and PBV Hand-sanitizing stations. We contract for our own kybos to have more control over their placement in our campsites. Our Royal Flush, the restroom trailer is much more pleasant than kybos, and well-lit at night. It offers flushing toilets and urinals, sinks and soap-dispensers, mirrors, ventilation fans, and lighting. 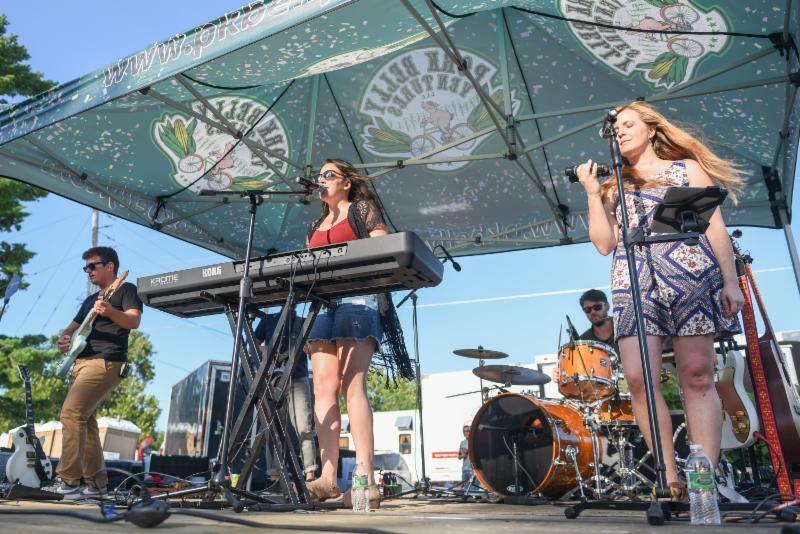 Live Music on Stage Every Night From Saturday night to Friday night, we'll have talented musicians on stage. Music through dinner till the fireflies come out. The Social Zone with Misting Fans This year, you'll find more shade in camp--more to come on that subject. Our shady circus tents with chairs provide a place to sit down and join a conversation. You'll also find a misting system to refresh you. The PBV Team Shirt We're working on a new design. Be sure to include your shirt size when you apply online for our Weeklong Support. 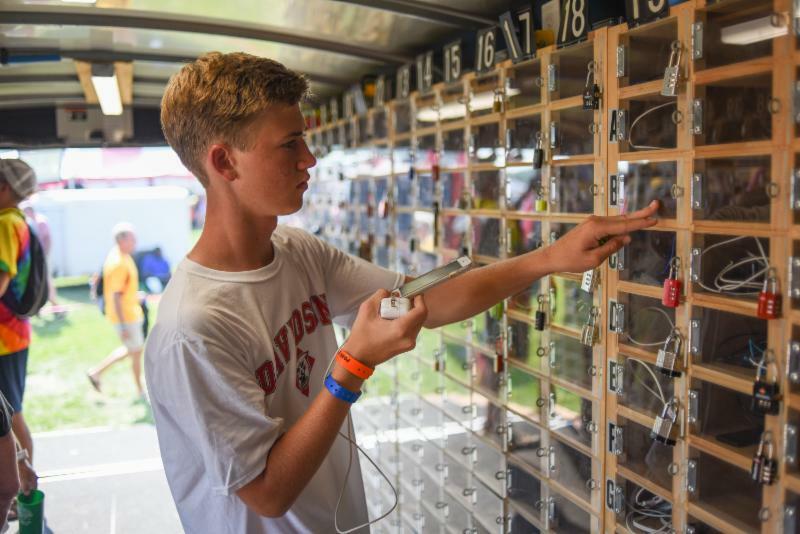 Phone-Charging Trailerswith locking compartments for charging electronic devices. Both trailers will be locked overnight, but charging continues until the trailers are unlocked in the morning about 5:00. Campsite Orientation Board We're busy creating this new feature, which will be near our Front Desk. We plan to blow up each campsite map and place it on a metal display board, so that moveable magnetic pieces will direct you to all parts of our infrastructure each day. Campsite Orientation BoardWe're busy creating this new feature, which will be near our Front Desk. We plan to blow up each campsite map and place it on a metal display board, so that moveable magnetic pieces will direct you to all parts of our infrastructure each day. Ice-cold beverages at the Front Desk, about 90 cents each, plus Free Lemonade in the afternoon and through dinner. GPX Files, to help you find camp via your Garmin or other mapping computer. We'll send files prior to RAGBRAI. Hot Morning Coffee at Our NEW Coffee Trailer We're bringing the coffee spigot down to counter height with our newly built coffee trailer. One awning swings open for coffee service, and another for cream and sugar. Kim and Dave start brewing at 4:30 a.m., six gallons every eight minutes. Hot tea, too. ABOVE RIGHT: George reaching up for coffee on the Roll with It trailer... but this year, we'll roll out the new coffee trailer and bring the spigots down to countertop level. Professional Bike Mechanics, great guys and girls, set up in camp daily from 3:00 p.m. on to help you with minor repairs. PBV's Midweek Laundry Service (optional, extra charge of $20) We'll take your stuff from wet and smelly to dry, fresh, and folded. That duffel will smell better! Pete's Shower Thingy We have shower trailers now, but Porkers still rely on this RAGBRAI classic for brushing their teeth or filling water bottles. It's a table, plumbed with five spigots and equipped with a mirror on both sides. Use it to cool off. This Thingy is available in the morning until 7:00 a.m.
Pump Thingy, a special compressor and pressure regulator to make pumping your tires a breeze. Free weeklong storage of your hard-shell bike case or bike box (for those who bring a case on the plane or ship the bike to Iowa), free to weeklong Porkers. Luxury SAG Service A day off the bike can be a game-changer, and we offer a ride from overnight town to overnight town. (We can't pick you up in the middle of your cycling day.) Description below, additional charge of $25 per use. Upwards of a hundred friendly, able-bodied, can-do crew members (not including bike mechanics or massage therapists) to help, comfort, and revive you. Other Needs: During the waking hours, there is always an available crew member or crew chief to answer your questions or help you. We always have three or more paramedics on our crew. If you don't know who to ask, start at the front desk. They have band aids, a hammer for your stakes, a ziplock bag, whatever you need. 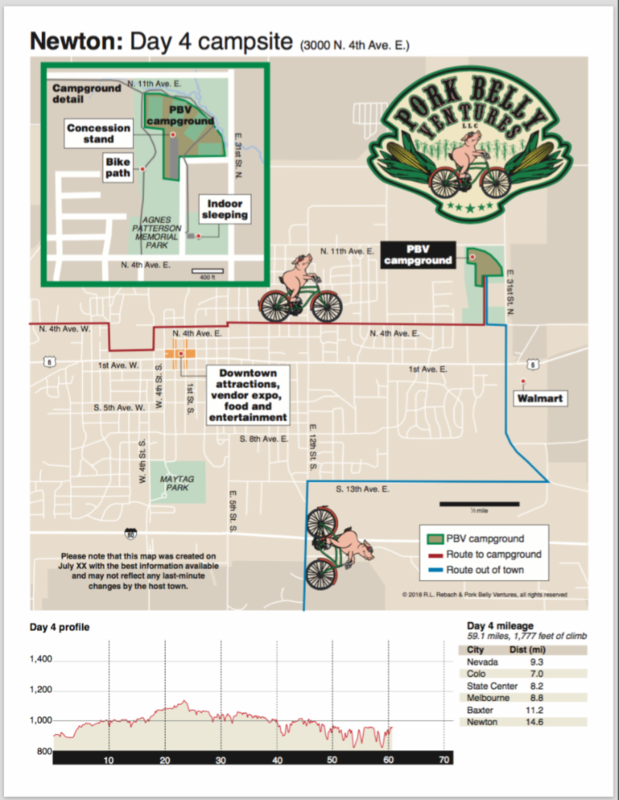 PBV Host-Town Maps sent to you in PDF format, showing our campsites in relationship to other amenities, with GeoBike Elevation Statistics for each RAGBRAI day. At RIGHT, this is one of last year's maps. The Pork Belly App for Smartphones, to help you learn more about our charter and RAGBRAI before the ride, with useful tools like route maps and host-town maps during the ride. Throughout the season, our updates are published on the App. It's FREE--get it now at your App Store. A slideshow of our week together--useful in recruiting friends to join you next year! *Each town's host committee has the final say on shower venders. Most towns appreciate us bringing our shower trailers, and this has never happened, BUT it's possible that a town may prefer that we use their showers instead of ours. When we scout in early May, we'll make arrangements in each town, and in any case, every Porker will receive a daily shower from PBV. 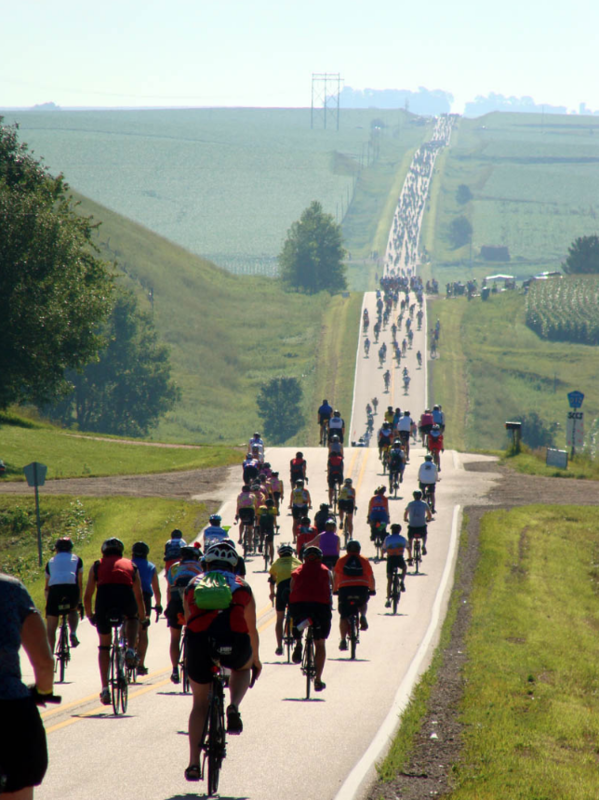 Can I ride RAGBRAI without the support of a charter? Yes, but think about the huge throng of RAGBRAI. Why go it alone when there's a charter for just about every budget? It only makes sense to have a home base. If our prices don't suit your budget, by all means call us so we can recommend another charter. A basic service to carry your baggage and provide a campsite is in the neighborhood of $200, but it will not include amenities in camp like those we provide. After you find your campsite each day, be prepared to wander the overnight town in search of your shower, snacks and meals, bike mechanics, beverages, phone-charging, and so on. After a 70-mile ride, this can be disheartening. The Weeklong Support of PBV could mean the difference between a complicated, exhausting bike trip and a carefree athletic adventure. This is your vacation after all, and we hope we don't seem immodest when we say that the extra you spend for our Weeklong Support could be the best money you spend all week. 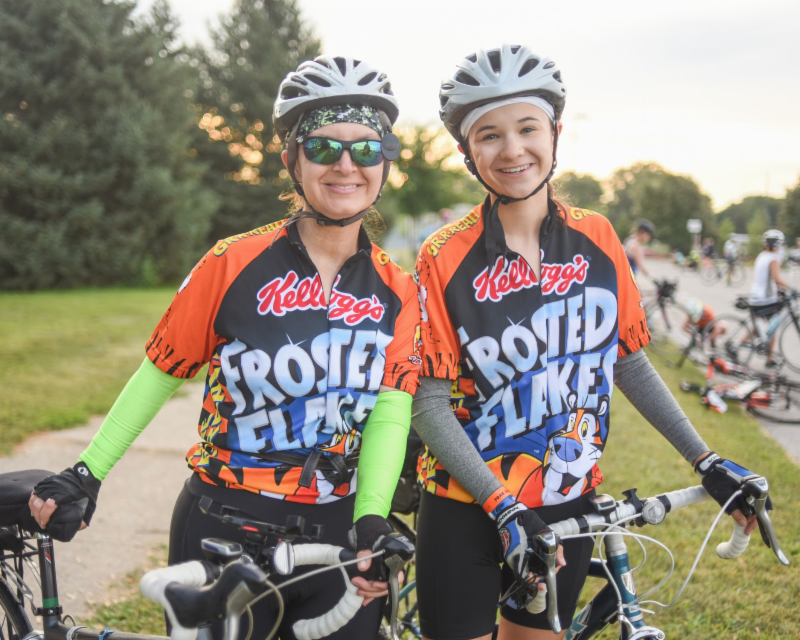 Our riders like to focus on riding their miles and enjoying their Week in the Corn. They depend on us for the lively little Pork village that they can call home. They may explore the overnight towns, but if they happen to be tuckered out at the end of a long hot road, they can find their shower, snacks and meals, cold drinks, an electrical outlet, a shady social area, friendly bike mechanics, restorative massage therapy, and some excellent live music right in camp. Some of our riders are dealing with a medical issue and appreciate an extra level of support. We can refrigerate medication. We have three licensed paramedics on our crew. We provide a comfortable (and legal) option for sagging on any given day of RAGBRAI. 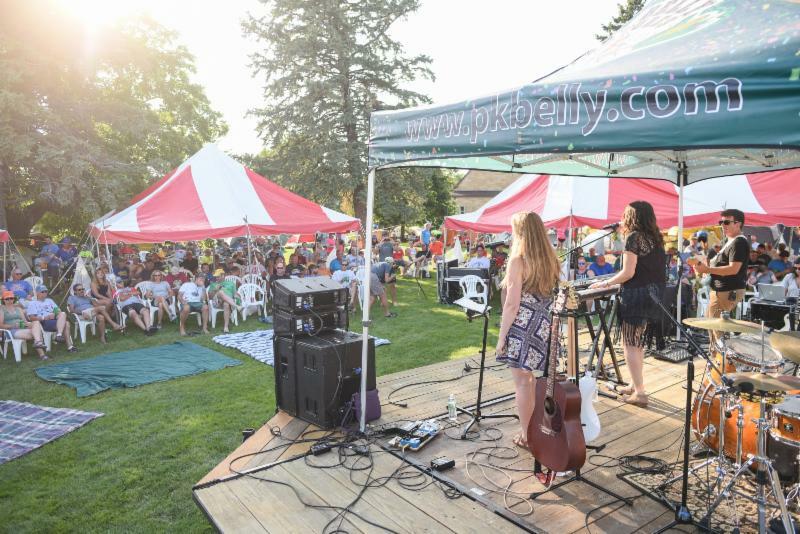 What's included in Pork Belly Ventures' Tent Rental and Daily Set-up? Our quality rental tents are 63 square feet (8.5' X 7.5'). With duffels inside, we consider our tent a roomy for one person and cozy for two. You can share it and split the cost, or you can occupy it alone. 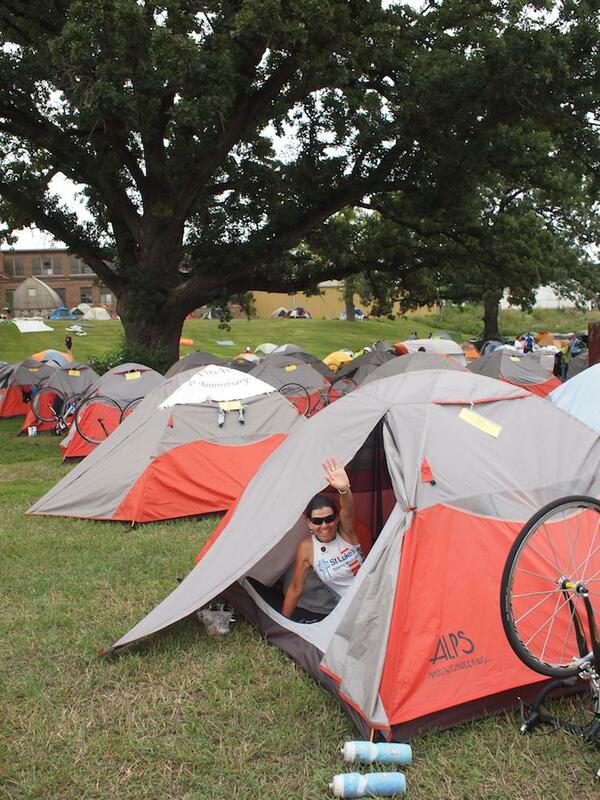 Tent-renters simply pack up their bags in the morning, leave them inside the tent, and pedal away. Enjoy your ride, and in the next host town you'll find your chores are already done--tent up with bags inside--so you can catch your breath under canopies or head off to the shower immediately. PBV has made a significant investment in our rental tents these last few years, replacing virtually all of our tents and poles. We'll set up Tent City on the same grid every day. Address cards will help you locate yours. We're happy to arrange the grid so that friends are next door to each other (but you'll need a common group name on all applications). This service has sold out in the past, so it might be wise to claim your tent early in the season. Hours of Access to Your Rental Tent: We'll aim for set-up by 1:00 p.m. each day, but host town traffic or inclement weather might put our crew a bit behind. If you pride yourself on arriving very early in camp, we don't recommend using the tent service--you'll be happier if you just set up your own tent on your own schedule. We include this paragraph, Porkers, so that there will be no misunderstandings about our Rental Tent Service. We will set up the tent grid on an average piece of real estate within our campsite. Please understand that it will not necessarily be the best part of our campsite, but it might. Tent City will almost certainly not be the shadiest part of our campsite. But it could catch some shade, as in the photos above. On some days, Tent City will be very close to our amenities, and on other days you might walk a across the campsite to use showers or the charging trailers or other services. No matter what your tent location on the grid, there will be some days when you find your location more convenient than on other days. We will scout and select lovely campsites in our host towns, but wherever we go, we have to work with our hosts and work with what we have. We don't recommend three to a tent unless one occupant is a child, and there's an extra charge of $100 for handling the third person's baggage. Suppose I want to bring my own tent? More than half of our Porkers do that. We'll carry your tent and other gear (two-bag-per-person limit) from town to town, and we'll have plenty of camping space for everyone. Those who bring their own tents do their own set-up and take-down, bringing their bags to the baggage truck each morning. If you bring your own tent, you'll have more choices of where to camp (versus your fixed spot on our large grid of rental tents). Should I book PBV Support and/or Tent before booking my shuttles? Do I have to book shuttles now? If you haven’t firmed up your travel plans, it’s a good idea to wait on choosing your shuttles. Many people go ahead and include our support and/or tent service on the application, but wait until May to add their shuttles. What's the daily Pork Shower like? It's hot--we never run out of hot water. It's cool--the trailers are air-conditioned. It's private--your dressing area is adjacent to your shower stall. It's convenient--located right in camp, and your towel is included. Each stall has a soap dispenser. It's accessible--we have 56 stalls on three trailers, so even at peak times the waits are relatively short in the context of RAGBRAI. One of our trailers will stay open until about 8:30 pm. It's included--with your PBV wristband, you can take more than one shower a day if you like. Please Note: On an event like RAGBRAI, waiting in line is normal. At peak times of the day, usually late afternoon, lines may form for our showers, even though we have 56 stalls in camp (up from 36 stalls in 2014). Remember, please, that many RAGBRAIers will walk or take a shuttle to a shower facility and wait in line for cold water and no privacy. You, on the other hand, will be surrounded by amenities in Pork Camp, and any waiting will result in your hot and private shower on an air-conditioned trailer right in our campsite. What if I want to SAG, take a day off the bike? We offer a very comfortable and secure way for you and your bike to get to the next overnight town for $25 per day. We hire a cushy 56-passenger motorcoach and driver for the purpose of sagging riders who do not choose to cycle on a given day. We'll transport bikes by hanging them by a wheel on a specially outfitted trailer. You're welcome to place bags under the bus for immediate access to them in the next campsite. You'll depart each day at 7:00 a.m., and you'll be in our new camp by about 9:30 a.m. The bus has AC and a restroom, the seats are soft, and you can snooze all the way to the next host town. Suppose I can only ride half the week? PBV has always prorated our Weeklong Support. Our day rate is $65 per person per day. We'll publish more about the Half Hog Shuttles in our next update. What's the advantage of booking a round trip into and out of Omaha? Omaha is our most popular airport shuttle, convenient for those who drive in from the west or the south and for those who fly to Iowa. With our round-trip Omaha service, we pretty much take care of you from the time you reach baggage claim in Omaha to the time you step off our bus at your Omaha airport hotel on the evening of the 27th. You simply make air and hotel reservations and register with us. (See below for Pork Hotels.) We'll meet you at the Omaha airport (hotel parking lot) and deliver you to the start town on a comfy coach. You're ours for eight days. At the end of the ride, climb aboard our Omaha-bound coach and doze off. After a meal stop, we'll drop you at our side-by-side airport hotels. On Sunday, the free hotel shuttle will take you to the airport. Omaha airport parking is convenient, secure, and inexpensive. You'll find information below under "Airline Reservations, Hotels, and Parking." Will Pork Belly offer a shuttle from the end town to the nearest airport? Yes, and the nearest airport this year is the Quad Cities International Airport (MLI). Soon we will publish details and departure times for all shuttles. With 62 miles to ride on the last day of RAGBRAI, we plan to offer two afternoon departure times from Keokuk to the Quad Cities Airport in Moline, IL. This shuttle takes about two hours, barring traffic slowdowns. 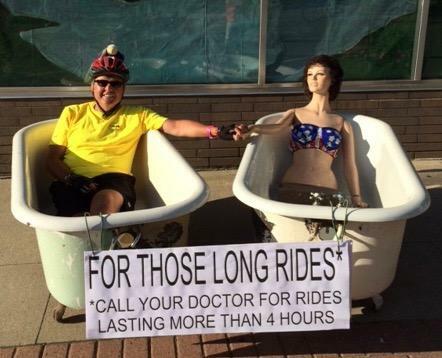 At the end of RAGBRAI, what are my transportation options with PBV? We can take you to the Des Moines Airport AmericInn Hotel, or we can take you to our side-by-side hotels at the Omaha airport. Or we can take you to the Quad Cities airport as explained above. We will publish all shuttle details and departure times in our next update. What are the shuttle departure times? At this writing, we have only known the route for a few hours, but we'll publish an update soon with estimated departure times on all shuttles. On the 20th, our last shuttle from Omaha airport is likely to be at 4:00 p.m. It's wise not to make airline reservations until we have published shuttle departure times. 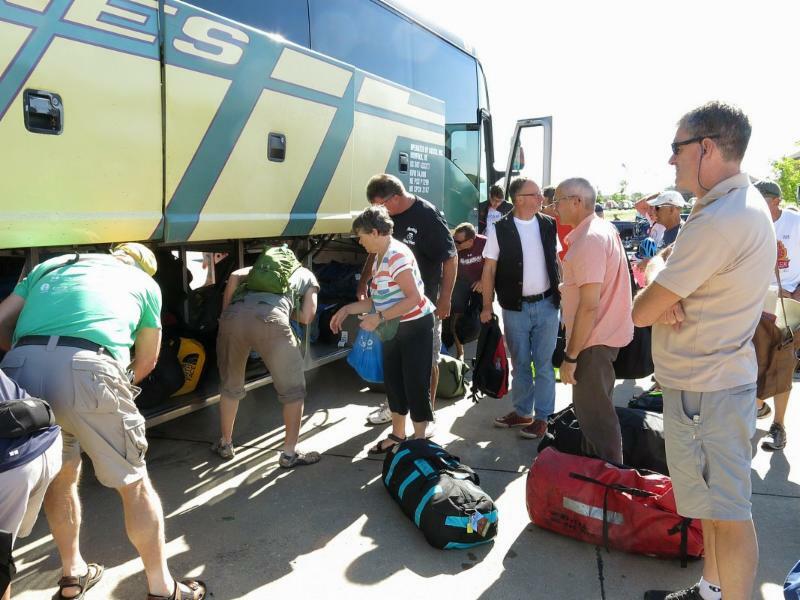 On the last day of RAGBRAI, it's likely that most shuttle departures will be between the hours of 1:00 and 3:00. More to come! What is the advantage of using the PBV East/West Shuttle?For those who live east of Iowa within driving distance of the end town, this shuttle is ideal. You drive to the end town on Friday the 19th (or earlier) and park your car in the designated long-term parking (the end-town host committee will charge a parking fee; see their website after May 1). You may also drive into the end town very early on Saturday--but plan for traffic congestion. Our crew will meet you there for bike loading on Friday around noon and/or early on Saturday, the 20th. By mid to late afternoon on Saturday, we'll have you and your bike in the start town. You bike for seven days, back to your car. Will PBV Run the East/West Shuttle on Friday as well as on Saturday Morning? Yes. The Friday option grows more popular every year. You'll have a chance to think about it and talk to your friends. Later on in the season, we'll ask you for your preferred departure day, Friday afternoon (two departure options) or Saturday morning (three departure options). What if I don't know which shuttle would be best for me? We don't expect you to know Iowa geography. Just write or call, and we'll talk through your options. Contact us, please, before you make airline reservations. 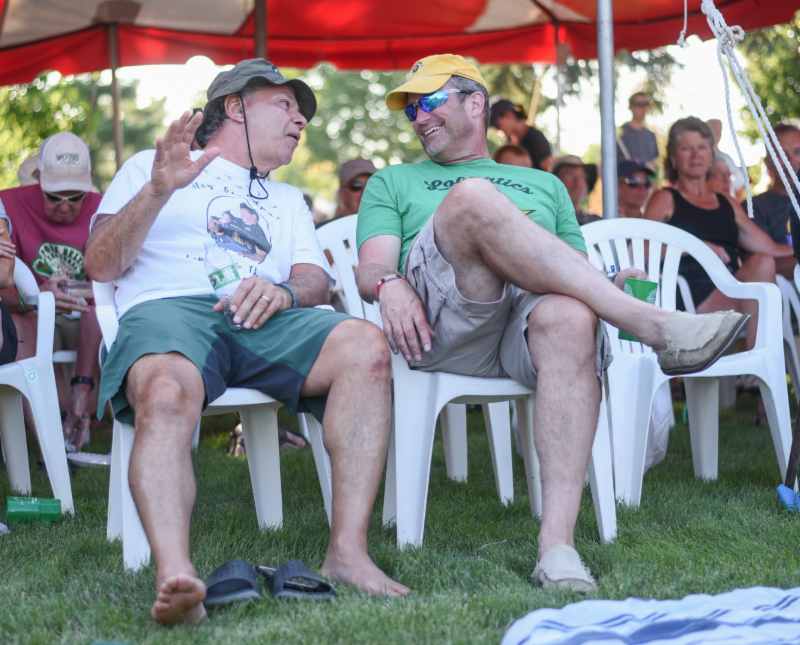 We could tell you stories about folks who booked a non-refundable ticket to an Iowa airport that was way off the route of RAGBRAI. Others parked a car in a spot that caused them extra driving. Let's talk. What if I don't even bike but want to experience RAGBRAI? No problem. A handful of people participate as non-riders with our charter every year. Often they have a son, daughter, or spouse who is cycling with our charter. We'll carry you on our 56-passenger motorcoach from overnight town to overnight town. You can wander our host town, get a nice massage, or hang out and talk to other non-riders until your friend or family member comes in from the road. To arrange to join PBV as a non-rider, please contact us. I, Tammy, will visit with you about your week and what to expect. May we bring our car or RV with PBV? This one is important, friends. We are adding this topic to our invitation letter to avoid any misunderstandings. 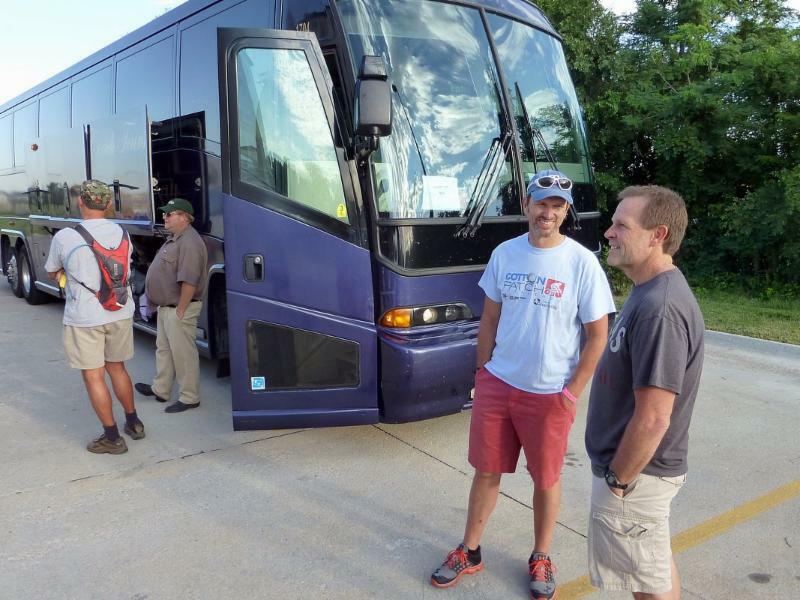 Neither non-riders nor riders traveling with charters may bring their own vehicles, whether or not they have secured the RAGBRAI vehicle pass. This is a strict RAGBRAI rule, which we have promised to obey: charters may not support anyone who has a personal vehicle on RAGBRAI. If you're with a charter, you must leave the vehicle passes for self-supporting smaller families and groups. We lead this section of our letter with a reminder to groups of friends and family joining us---please use a common group name on all applications of the group. It helps us serve you better. More below. In the past, a group leader might sign up several group members on one application, and each group member was able to mail in payment for his/her part of the fees. But given the fact that we now require the 10% deposit on a card, such a group leader would be on the hook for ten percent of all services on the application. Around May 15th, he/she would be faced with a large balance due for everybody on the application. If a group leader is willing to pay for everyone and settle up later, it's fine with us. But chances are that most group leaders will prefer that members take care of their own payments. Therefore, we recommend that group members complete their own applications and pay their own fees. Please see "Common Group Name" below. Family members, for whom one person is paying the expenses of all, may continue to put everyone on the same application. There is a group-name field on the PBV application. If two or more friends are joining Pork Belly, you should put a common group name on your application forms, like "Jones Group" or "Lucy's Friends" or "Dingbats" or "Misfits." Now is the time to choose your group name and communicate it to all members. If you want to be assigned to the same bus or be rental-tent neighbors, the group name allows us to meet your needs. We can serve you better when we know who is with whom. Individuals coming to PBV by themselves should leave the group-name field blank. Again, please leave it blank. Don't even type "just me" or "none." When we do bus rosters, it makes it far easier to find you if there's no group name. To create a new application, please hit "Apply" in the center of your screen and follow the prompts, entering a username and password. And, importantly, if it's your first time, make sure you tick the box that indicates this is a new application. Then, you'll select services, and click "Submit." Everyone who signs up for services pays at least ten percent of the balance by credit card. There’s no convenience fee for the ten percent deposit that holds your reservation for services (you don’t pay 3% for this convenience). You may still choose to mail a check for your remaining balance; see the explanation below. Your remaining balance will not be due until May 15th. Please note that if you select our Cancellation Protection, 15% is charged to your credit card when you initially apply. That includes the 10% deposit and 5% for the cancellation protection. Both the deposit and the protection are non-refundable. This has always been the case, but we state it explicitly so there's no misunderstanding. Our Cancellation Policy and Cancellation Protection are explained more fully below. At the initial time of application, you may pay the whole thing by credit card in a single transaction. For this convenience, a 3% processing fee will be assessed. For folks like us who would want to save that 3% service charge, feel free to use the option of mailing a check for your 90% balance. No hurry. Just send it by May 15th. In any case, you'll pay no fee for putting your 10% deposit on your card. Before June 15th, you can still cancel part or all of your PBV services and receive a 90% refund on the amount of services reserved. You can drop services or cancel entirely by email, and we'll process your refund quickly. 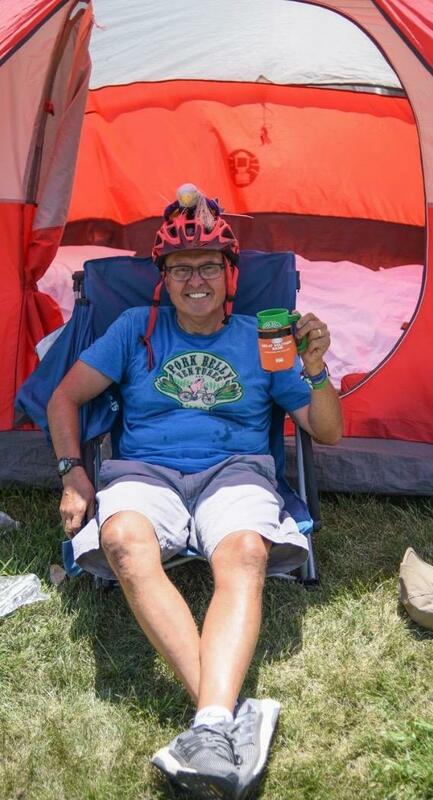 We'll also try to find you a buyer for your official RAGBRAI wristband. On or after June 15th, we make no refunds. More on Cancellation below. Pork Belly Ventures offers Cancellation Protection for an additional five percent (5%). 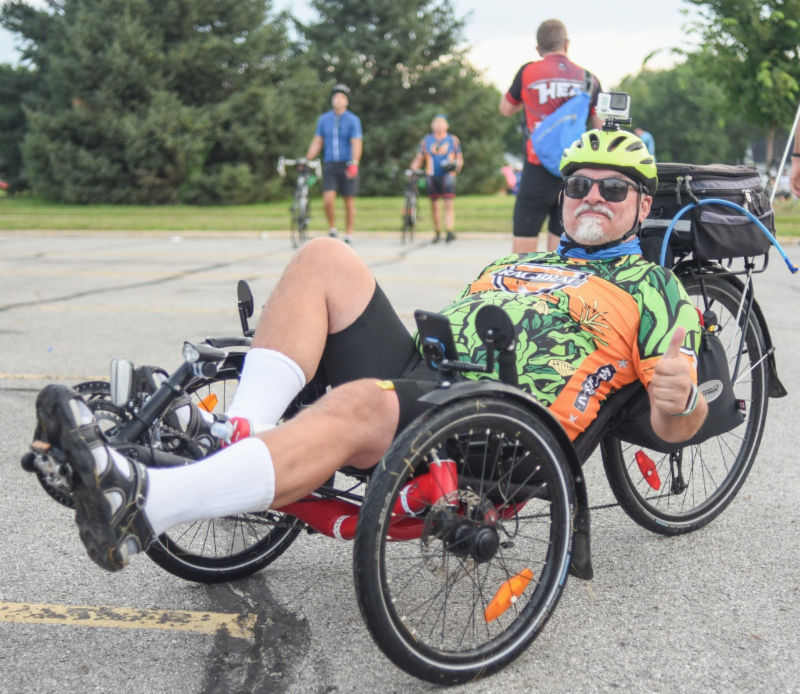 Cancellation Protection extends your refund deadline from June 15th to Wednesday, July 18th at 10:00 p.m. July 18th is the Wednesday before RAGBRAI. The additional 5% for protection is due at the time of registration. Our Cancellation Protection is explained more fully at pkbelly.com. More on Cancellation Protection below. The first ten percent (10%) must be paid by credit card, and is non-refundable as stated in our cancellation policy. The five-percent (5%) charge for our optional cancellation protection extends the 90% refund deadline from June 15 to July 18th. It is non-refundable. Everyone who completes an application and pays his/her ten percent by credit card will have a firm reservation with PBV. Completing an application without paying the deposit doesn't give you a reservation, even though the information is retained on your application. When you submit the registration online and pay the deposit, you will receive an auto-generated email confirmation, showing your payment and any remaining balance. Please read this section and the next section on Cancellation Protection carefully and contact us to make sure you understand before you register. Before Saturday, June 15th, you can still cancel part or all of your PBV services and receive a 90% refund for the services you have reserved. You can drop services or cancel entirely by email, and we'll send you a refund check quickly. We'll also try to find you a buyer for your wristband. We will include our written cancellation policy in several email updates prior to the deadline of June 15th: on or after the 15th of June, we will make no refund. First of all, if you have any trouble understanding this option, you should call or email us for an explanation. You have only one opportunity to purchase this protection, at the time of your original registration. 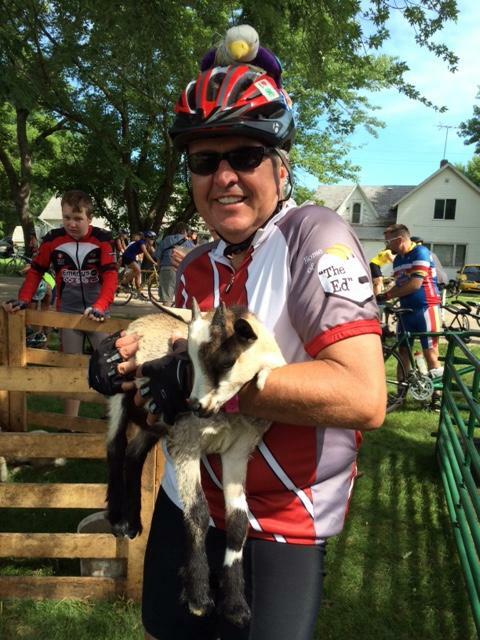 Here are some of the things that have happened to our RAGBRAIers during the last month before RAGBRAI. The boss decided they couldn't be spared at work. They have been diagnosed with an illness. A member of their family has needed support through a crisis. People have been struck by a car while training for the ride. Their plans for childcare have fallen through. They have lost a loved one. Although we-and every other tour operator-must have a refund deadline and cancellation policy, and although ours is quite liberal, and even though we publish our cancellation policy several times prior to the deadline every year, we can't help but feel for those people who cancelled out of necessity after the June deadline. After attending a conference of bicycle tour directors and discussing this issue with other tour operators, we offer this solution. This protection applies only to the period from June 15 to July 17 at 10:00 p.m. For anyone who cancels later than 10:00 p.m. on July 17th, we make no refund. This protection is not applicable to people who travel to Iowa for RAGBRAI and leave the ride early for any reason. 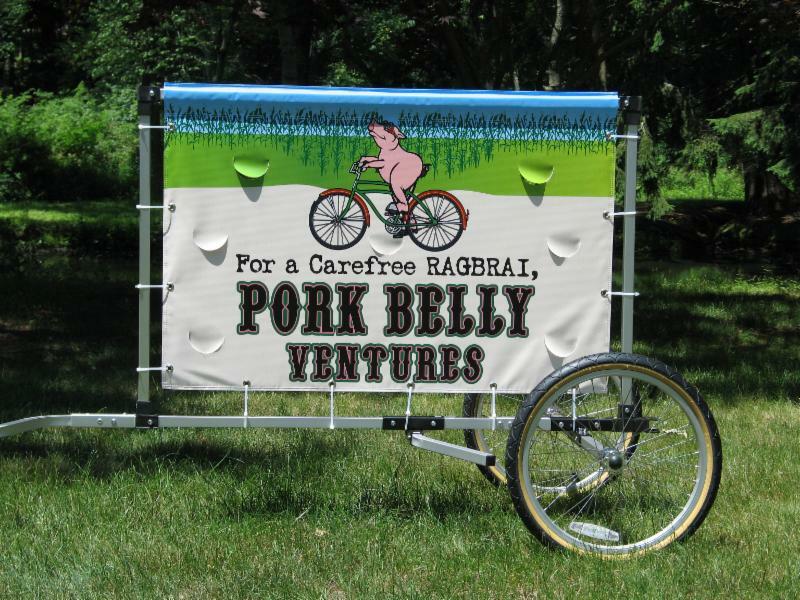 This protection applies only to fees paid to Pork Belly Ventures, not your RAGBRAI registration fee or other travel expenses. To use this protection, you must contact us by time-stamped email by 10:00 p.m. on Wednesday, July 17. Your refund will be processed at our earliest convenience, possibly in the early days of August, if your cancellation comes at the last moment. In short, without protection, you stand to lose 100% of your fees paid to PBV. But by spending 5% up front on a non-refundable fee, you can receive a 90% refund if you cancel for any reason all the way through July 17 at 10:00 p.m. You may purchase this protection at the original time of registration ONLY. 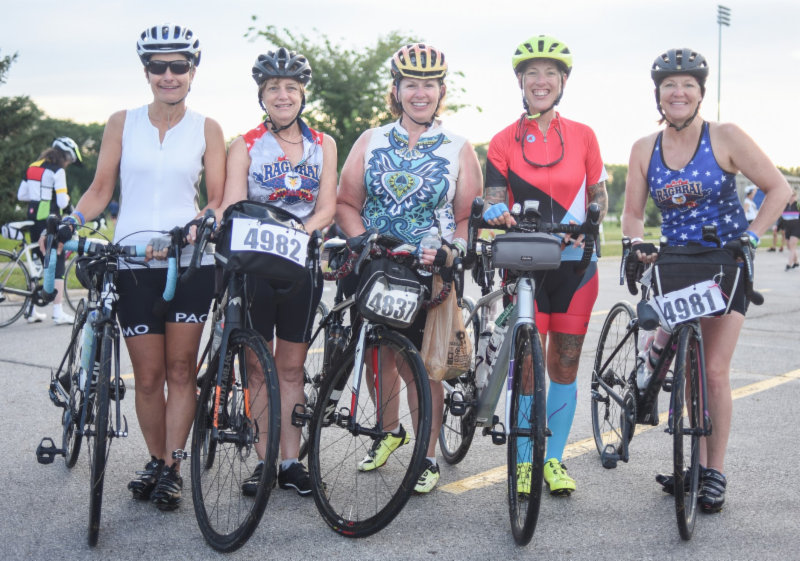 Although some bike clubs can register their riders for RAGBRAI, charters may not do so. 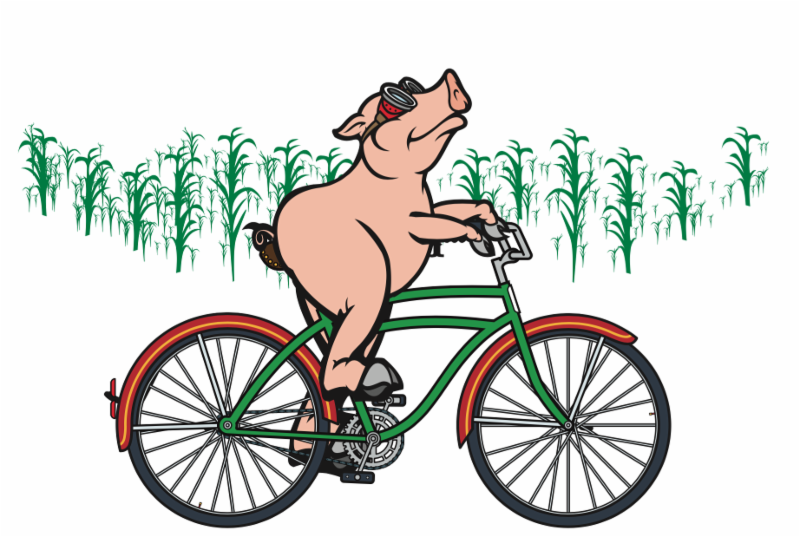 Therefore, every Porker will go to ragbrai.com and sign up between mid-November and the deadline of April 1. Registering at RAGBRAI.com should be done at a desktop or laptop computer. You may encounter problems if you attempt to sign up with your phone or tablet. 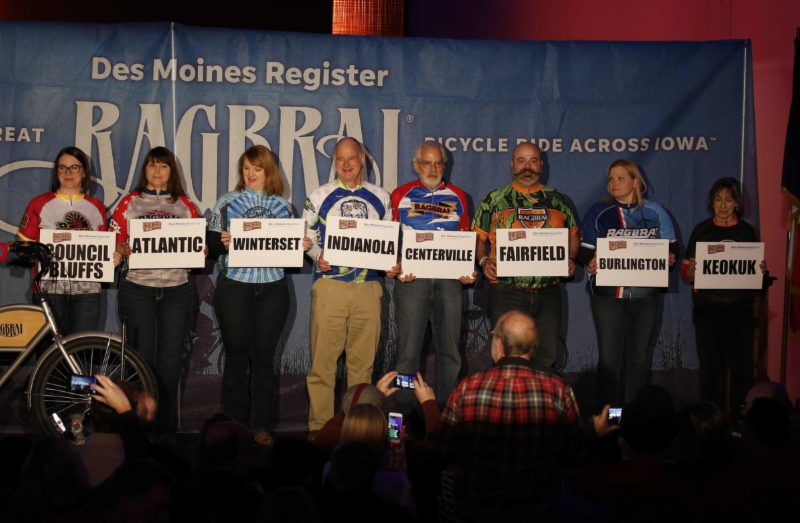 By May 1, RAGBRAI will send out confirmations to registered RAGBRAI riders of 2019. We hear this question so often that we want to address it for you here. 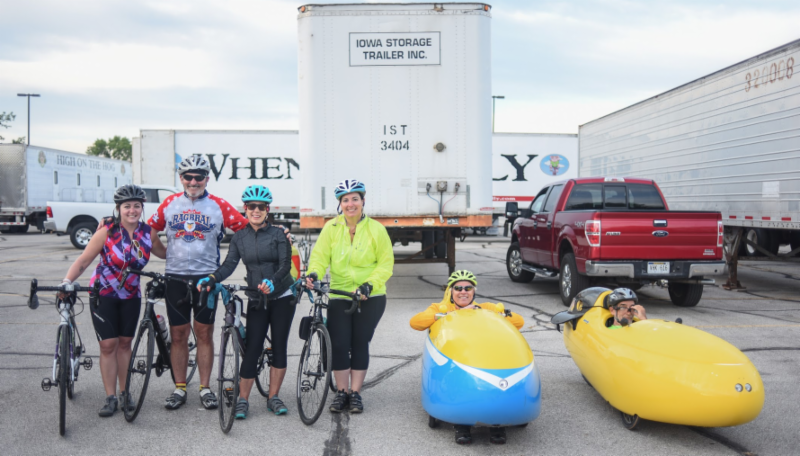 Many newbies ask us if they should delay registering with PBV until they learn around May 1 whether they have been drawn in the RAGBRAI "lottery." Delay registering if you want to, but the lottery is not a reason to do so. 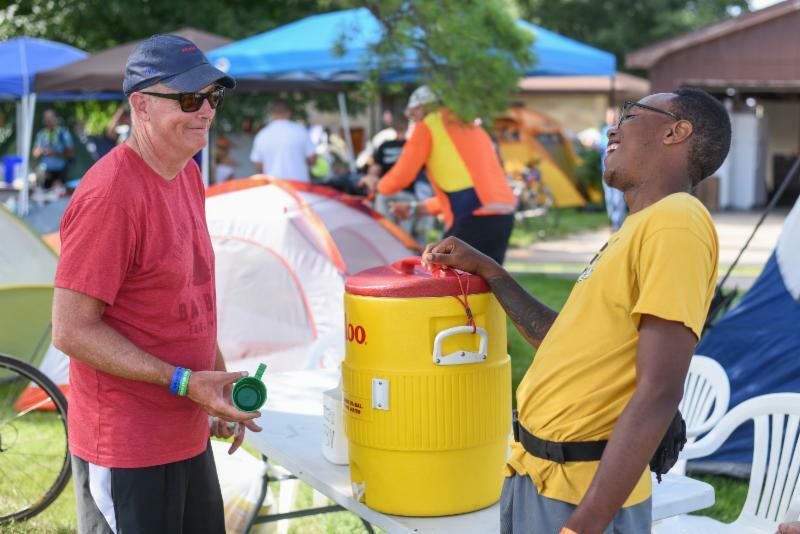 For a long time now, virtually everyone who completed their RAGBRAI application properly and on time has gotten into the ride. 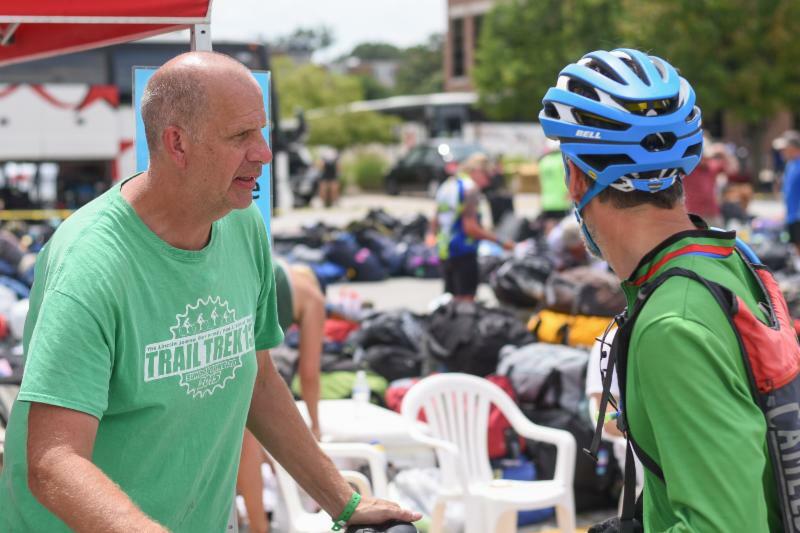 We don't know all the ins and outs, but when we and other charters have asked RAGBRAI officials about this, they've told us, "Tell your folks not to worry." If you realize after April 1 that you can come to Iowa after all, please contact us and we'll introduce you to a wristband seller. You can follow the Register's simple procedure for transferring wristbands via their online transfer form. Once you do that transfer, you'll be legit, as though you had signed up in January. 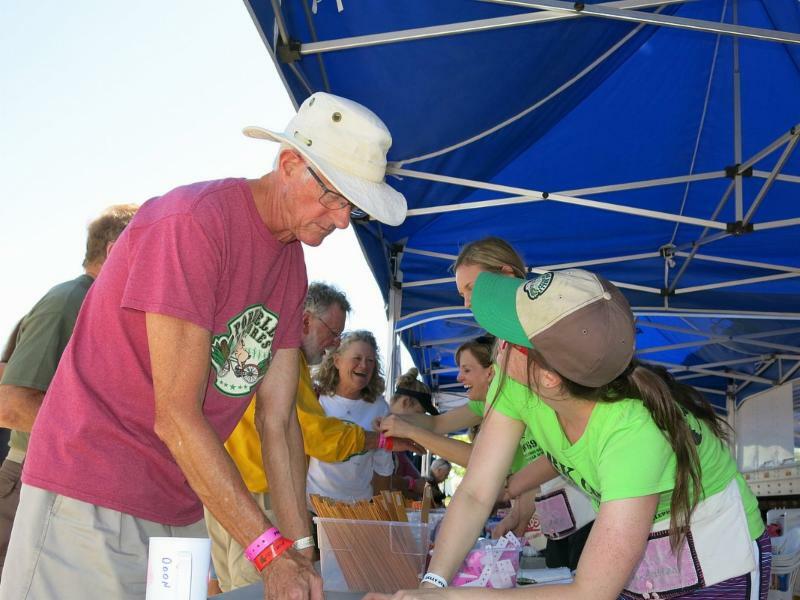 In the very unlikely event that you are not selected in the lottery (if you made a mistake on the application or missed the deadline), contact us for the same kind of help in finding a RAGBRAI wristband. In twenty-three years, we have never failed to find a wristband for a patient buyer. If you are concerned about getting one of our rental tents, they tend to sell out in May (we usually have a waiting list). For a few years, our Weeklong Support has sold out in May or early June. We never know from year to year if or when services will sell out, but you might be wise not to wait too long. Our company, SendMyBike.com, has been the best ground game on RAGBRAI for many years, and we have done the lion's share of bike shipping to and from RAGBRAI. For the first time, SendMyBike.com will partner with Bike Flights to improve both our price and our service. Bike Flights will provide all shipping labels, while SendMyBike.com and PBV provide the ground game. It's the best of both worlds. We'll continue to offer the popular option of having your shipped bike pre-assembled before you arrive in Iowa. Give us a little time to work out the details, and expect more on bike shipping next month! When should I make my airline reservations? Please give us a little time after the route announcement to publish our airport shuttle departure times. On the night of the route announcement, we hurry to publish this invitation. Then, we take the following week to think through the implications of the new route, locations of airports in relation to the overnight towns, cycling distances, driving distances and so on. Very soon, we'll publish Pork Belly Update #1 with shuttle details and departure times before and after RAGBRAI. Once you know our shuttle departure times, you can make your airline reservations with confidence. If I'm driving to the end town on Friday, how can I get reservations at a hotel? For hotel rooms in eastern Iowa near the end town, you may check the end-town website on about May 1st for nearby hotels. Or you might Google hotels relatively close to long-term parking. PBV will not have a designated hotel in eastern Iowa. If I'm driving to the end town on Friday, what are my overnight options? Pork Belly Ventures always attempts to find inexpensive indoor camping in the end town. 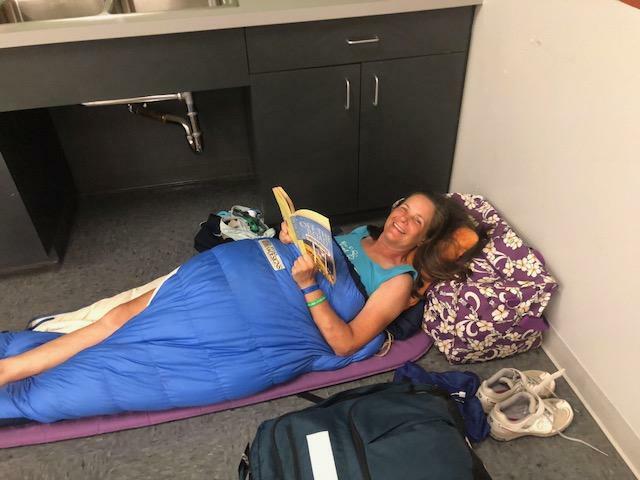 We have reserved gymnasiums, school facilities, YMCAs, and other large rooms, where folks could make a small donation to roll out their sleeping bags at a location relatively close to long-term parking. Last year in Davenport, indoor sleeping was not available, but hotel rooms were plentiful. Again this year, we will make every effort to arrange inexpensive indoor accommodations. Also, camping is always available on Friday night in the end town. Will weeklong parking be available at the end town? Yes, and our bike-loading and bus-boarding area for the east/west shuttle is typically located very near the long-term parking area. Hold tight and watch our updates or check the end-town website after May 1 to learn where long-term parking will be located exactly. 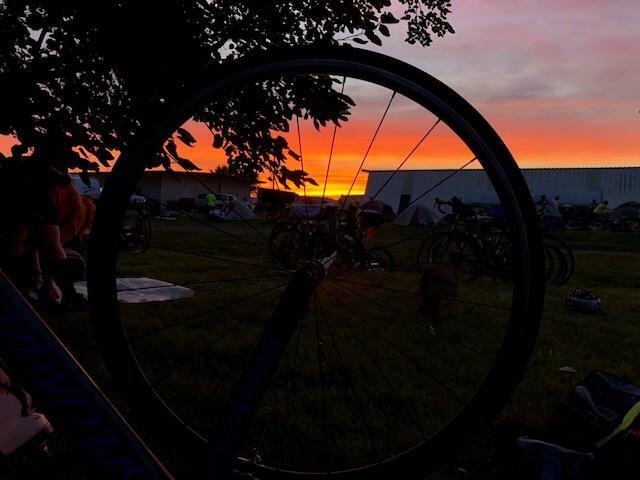 Camping, food, and showers are often provided in the end town on the Friday night before RAGBRAI, and we'll know more after we scout in May. If I'm flying or driving into Omaha, will I need reservations at a hotel? 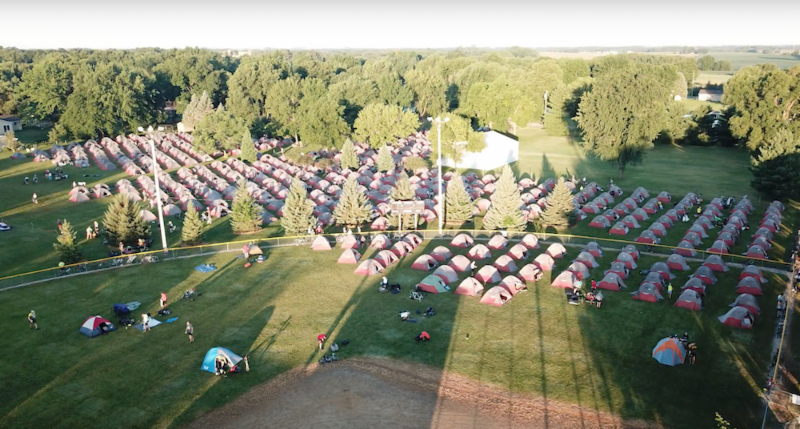 On the nights of July 21st through the 27th, you will be camping with PBV, but if you're flying into Omaha on Friday, the 19th, and/or returning with us to Omaha late on Saturday evening, the 27th, you will need Omaha hotel reservations. We have room blocks for both nights at two side-by-side airport hotels. What are PBV's designated Omaha airport hotels? Our two side-by-side hotels at the Omaha airport are the Best Western Plus and the Candlewood Suites. These hotels are owned by the same company and run by an excellent team of managers. They are very nice. PLEASE NOTE THAT THESE HOTELS WILL PROVIDE AMENITIES AND BREAKFAST ONLY FOR THOSE WHO ARE GUESTS OF ONE HOTEL OR THE OTHER. Mention our name to reserve your king or double queen room for $130. 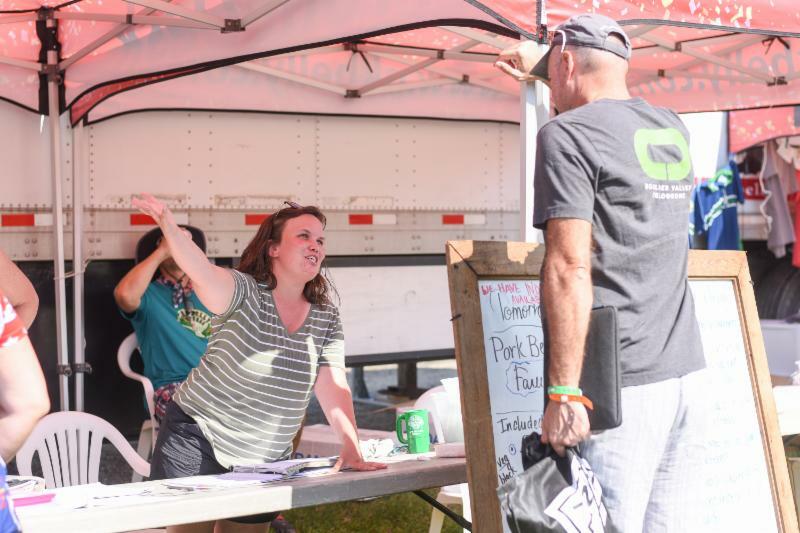 Hospitality areas available to our guests before and after RAGBRAI. Triple-sheeting is the standard at this hotel. Across the street from a large convenience store and Subway sandwich shop. All guest rooms are being remodeled at this writing--new sheets and towels too. Across the street from a large convenience store and Subway. Breakfast served next door, but great little convenience store in the lobby with CHEAP everything. Because Best Western Plus is located in Iowa, and Candlewood Suites is located in Nebraska (yes, they are side-by-side), the tax on Candlewood is 6% more. And if you reserved at Candlewood online, please change your reservation by phoning the hotel directly. Your rate will be reduced to our negotiated rate of $130 per night. All Pork Belly buses will depart from and return to the Omaha airport Candlewood Suites, next door to the Best Western Plus. We advise flying or driving in on Friday. Please note that a very popular concert is booked in downtown Omaha on July 19th, Friday. Please don't wait this year. Book your Omaha Airport hotel rooms early. At times, we have run short on rooms, even with blocks at both hotels. If you are part of a large group coming into Omaha, please reserve only as many rooms as you will use. If you find you don't need them, release rooms back to our block. For safety reasons, the hotel staff will need an occupant's name for every room and a credit card number for each occupant (one per room). Cardholder and occupant should be the same person. Will weeklong parking be available near the Omaha airport?Yes, and there is no need to reserve it in advance. We'll publish more later, but valet service is available from the hotels. A shuttle will assist you in retrieving your car at week's end. Who is Pork Belly Ventures LLC? This is the 26th year of our partnership between brother and sister, Pete Phillips and Tammy Pavich. We and our extended family live here in our hometown, Council Bluffs, Iowa, across the Missouri River from Omaha, Nebraska. Our charter is best known for our Weeklong Support, full of extras and relative luxuries, described in greater detail above. We take pride in Iowa's hospitality and the kindness of people you'll meet all across our home state. 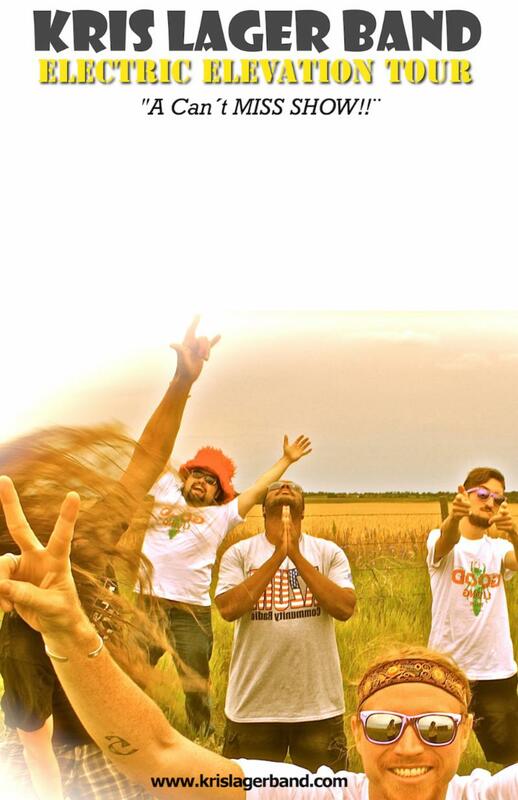 The Pork Belly crew will surprise and delight you with their helpful, cheerful attitudes. They are the most frequently mentioned subject on our Testimonials Page. Though their days are long and hard, they stay strong and chipper all week long. Many are schoolteachers, farmers, firefighters, and paramedics. The new generation is a muscular, energetic bunch of youngsters (many of them sons and daughters of schoolteachers, farmers, firefighters, and paramedics) who make the physical labor of PBV look almost easy. Our mom and dad have always helped us in more ways than we can tell you. And finally, a word about the folks who pass the corn with us. We seem to have a growing number of very fit men and women in their seventies who ride every year with us; however, most of our charter is thirties, forties, fifties, and sixties. You'll meet some youngsters, too. Every state in the union, several foreign countries, most professions, and many lifestyles, ethnicities, and cultures will be represented on our charter. Be sure to sit down under the canopies and strike up a conversation with a new acquaintance-you'll learn something. 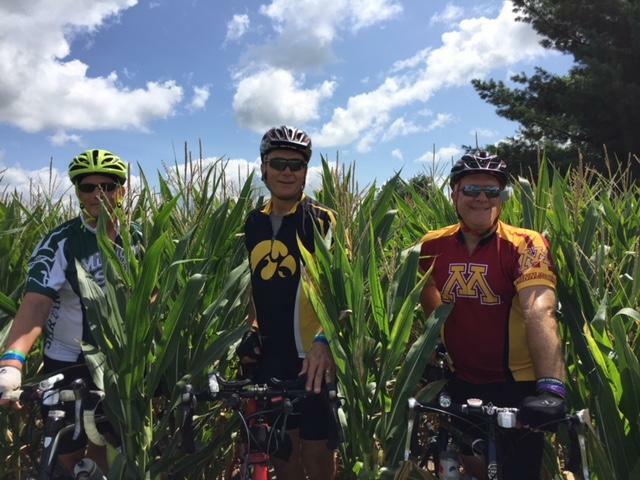 Every year, we're grateful for the first-timers who decide to give Iowa a try and for our RAGBRAI veterans who come back again to pass the corn. Pork Belly Ventures operates in full compliance with the Iowa and U.S. Departments of Transportation. What does it take to be a Porker? In short, can you roll with it? When you're sweaty, hot, hungry, and tired (and you will be), can you take it in stride? You'll soon be cleaned up, cooled down, sated, and rested, so in the meantime, treat the people who serve you, namely our friendly, hard-working crew, with courtesy. Courtesy. Courtesy. We will do our level best to help you have a great time. If you can shrug off a little temporary discomfort and keep your expectations reasonably low, you're a good match for Iowa and PBV. The best description of our charter is "neighborhood block party," not "college frat party," so with us, you're signing on for good, wholesome, healthy fun and quiet after 10:00 p.m. If you want a hard party or a late party, we're not a good fit for you. What if I have a problem or a special situation? Tell us what you need, and we'll try to help. Will PBV communicate with me about my July vacation? Over the course of the season, we send you about 20 email updates. Your next updates will have some fun stuff, along with the details and departure times of all PBV Shuttles. Until June, we'll send a couple of updates a month. In those last 60 days, we'll write to you more frequently. Our updates will offer you extras and add-on services, remind you of deadlines, give you a sense of our charter, and get you ready for this thing. The most important document to read is your June Letter, published as an email update in early June. It will provide deadlines, schedules, directions, and lots of other important stuff. You can skip other updates with little consequence. But you'll be glad you read your June Letter. If you feel that you understand our cancellation policy, our cancellation protection, and our method/s of payment, then by all means, sign up for services! You don't need to select your shuttles if your travel plans are unclear. You can simply sign up for our Weeklong Support and/or our Tent Service. Go to pkbelly.com and hit Login (upper right of screen) or Apply (center of screen) to create a new application. If you are signing up for the first time, you'll create your username and password--and remember to tick the box that indicates you're creating brand new login credentials. You will pay at least 10% by credit card with your balance due by May 15th. You will have the option of selecting our Cancellation Protection. When you hit Submit, you'll receive a confirmation by email. We're here to answer your questions, Porkers. whatever you need during your Week in the Corn.